This year’s event will feature 375 hand-picked artists, 45 varied vendor booths, 13 bands, 6 DJs, plus barbers and galleries, according to event organiser David Wood. As with previous years, the convention will continue to strive for greatness, exhibiting only the best in the industry. “It’s the quality of artists that make a great show; many shows accept anyone that wants to pay for the booth, but not us”. Tattoo aficionados won’t have to be passive spectators either, and might even get a chance to get tattooed from some of the world-renowned artists attending the convention. Brighton Tattoo Convention’s rebel and rock’n’roll spirit will be amplified thanks to their choice of entertainment. Every day, from 11am to 1am, rockabilly bands and DJs, such as The Fuzillis and Dave Mumbles will be performing for the enjoyment of convention goers. Moreover, various quirky and weird shops, such as Cranfield’s Curiosity Cabinet (a taxidermy shop), always have a booth at the convention so that visitors can explore stalls filled with peculiar paraphernalia. The variation of artists attending the convention will not only be based on their level of experience but also on their cultural background, as the artists attending will come from different parts of the world (Europe, USA, Canada and Australia), and focus on their unique styles. The show will feature a plethora of esteemed tattoo artists, such as stick and poke’s undisputed king Patrick Bates, but it will also showcase some of the best novices in the tattoo world right now. Wood remarks he’s always on the lookout for innovative and creative new artists. “I like to see the new applications each year and get excited about them”. 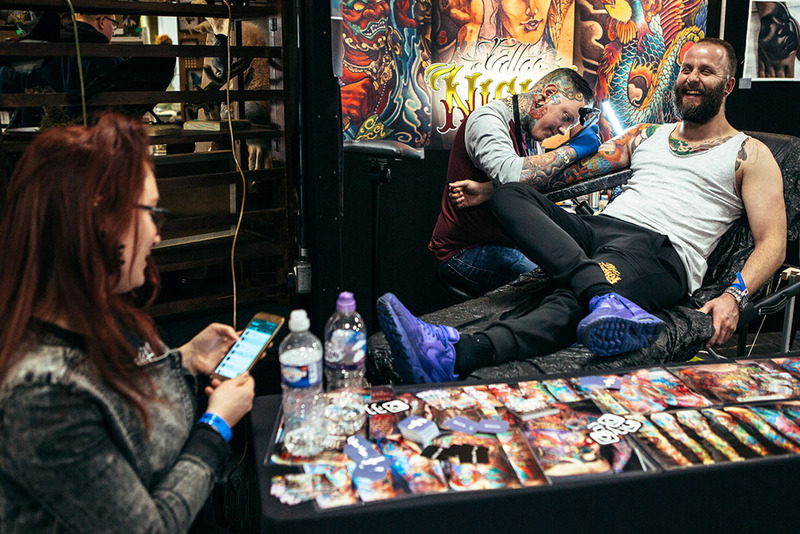 The convention will take place on Sat 23 and Sun 24 Feb, but for those struggling to restrain their tattoo fever, don’t worry – the organisers have got you covered. 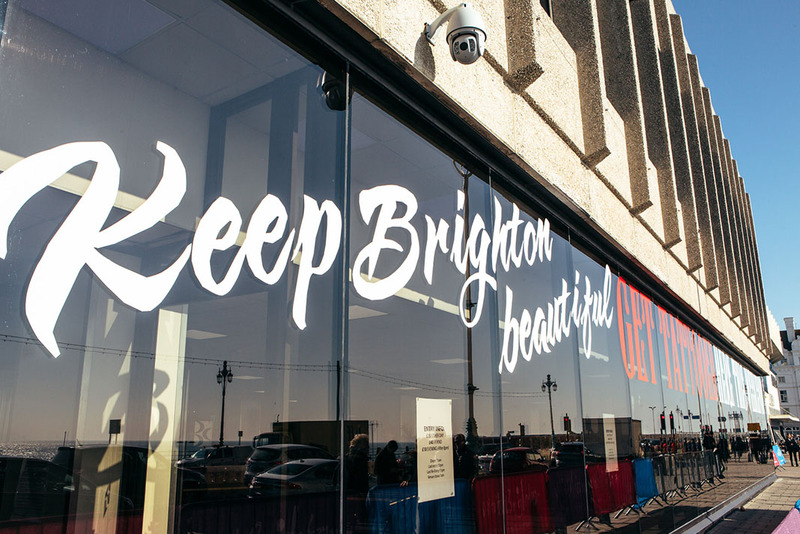 As it has for the past four years, the Brighton Tattoo Convention will set up a charity football match involving some of the best artists globally, helping a different local charity each year. This year, their charity of their choice is Greyhound Trust, a local charity which ensures that as many greyhounds as possible have a happy retirement. “Since a lot of the tattoo community is vegan we decided to turn our attention towards helping out our furry friends. We’re just a bunch of artists representing our tattoo community, trying to break the stereotype of old and show just how we can help in our local communities.” The match will be divided by English artists versus those from the rest of the world, with both teams being made up of exclusively tattoo artists. Aside from the football, there will also be a tattoo giveaway raffle, food stalls situated pitch-side, as well as free beer. Brighton’s own Tattoo Convention gets bigger and better every year and it attracts more and more visitors. Its organisers pour their whole energy into making sure that the convention represents the perfect meeting point for any tattoo enthusiast – making sure its a key calendar event year on year. The twelfth edition of the Brighton Tattoo Convention comes to Brighton Centre on Sat 23 – Sun 24 Feb. Day ickets £25 / weekend £40, or £8 for limited evening tickets (from 8pm).